The 199XRAY Medical ScopeMeter has all of the normal oscilloscope functions, as well as the speed, performance, and analysis power for the moredemanding applications. This high-performance oscilloscope offers specifications found on top-end bench instruments. 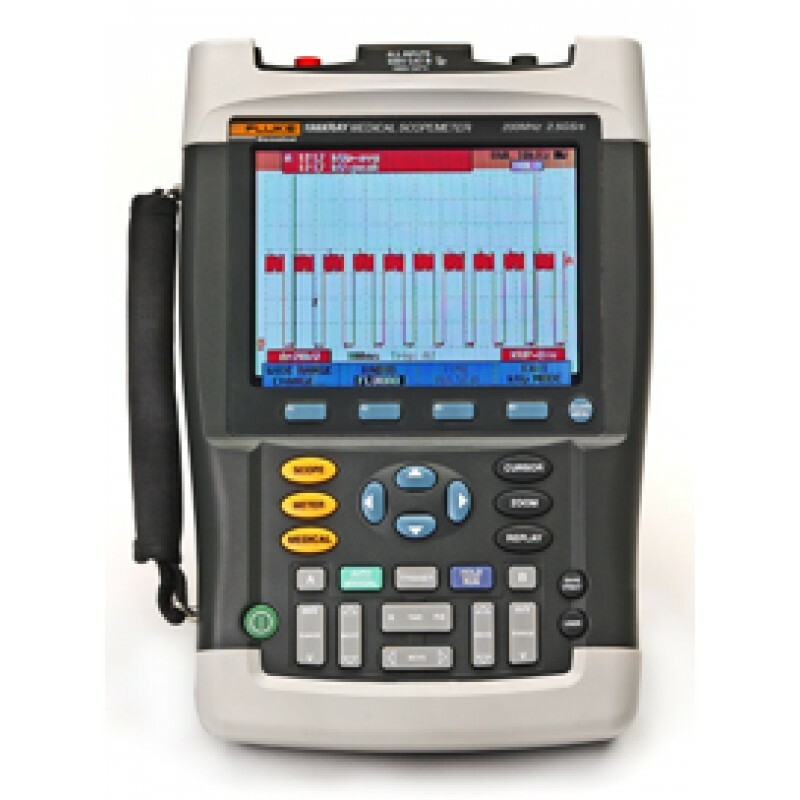 With up to 200 MHz bandwidth, 2.5 GS/s real-time sampling, and a deep memory of 27,500 points per input, the 199XRAY is ideal for engineers who need the full capabilities of a high-performance oscilloscope in a handheld, battery-powered instrument. In addition, the 199XRAY is especially designed for use with x-ray systems. This ScopeMeter displays kVp waveforms and direct kVp values simultaneously on an easy-to-read screen. Now you no longer have to waste time calculating scope traces to derive the kVp values. Using the cursors, you can now measure directly the amount of radiation produced by x-ray systems, or the total amount of charge applied to a system. Smart averaging gives the averaged waveform over successive acquisitions, reducing noise in the displayed waveform. Thanks to smart averaging, you can now also see an incidental curve of a different wave shape with no effect on the averaged curve. This allows you to see the averaged curve of a sequence of video lines, for example, while still seeing the incidental ï¬‚yback line ï¬‚ash by. The oscilloscope gives an immediate response when the signal makes large changes. Vertical offset is now extended to a maximum of 16 divisions, allowing vertical zoom-in for study of small details of the signal. Persistence mode with selectable decay time helps to ï¬nd anomalies in the wave shape and optimizes the display for color information when working with composite color video. Along with its triggering capability for standard, interlaced TV signals, the instrument also triggers on high-resolution, non-interlaced video systems. The ScopeMeter 199XRAY will trigger on all lines (nonselective), or can select an individual video line from systems with up to 2800 lines per frame.